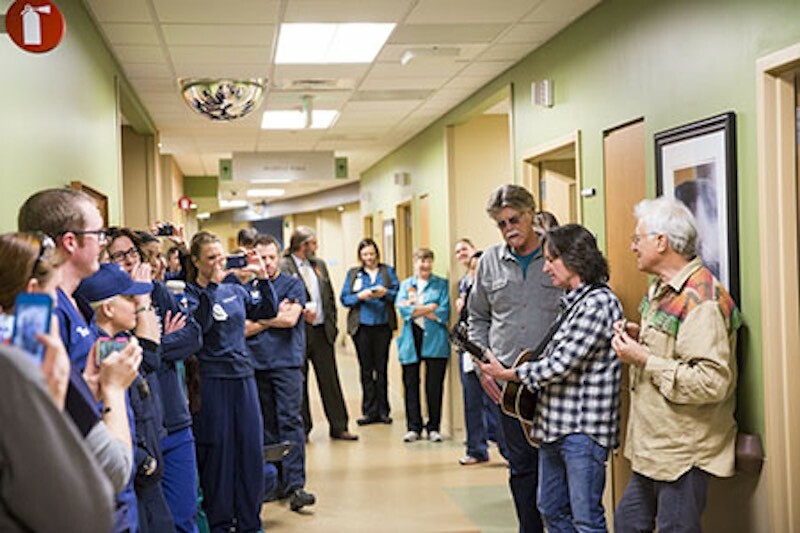 Nitty Gritty Dirt Band members Jeff Hanna, Jimmie Fadden and Bob Carpenter delivered the healing power of music to patients, visitors and staff during a visit to St. Anthony Hospital in Lakewood, Colo.
Our visit and tour of the hospital was the highlight of our weekend – getting to see firsthand the amazing work that the doctors, nurses and administrative staff are doing was humbling and inspiring. It was our pleasure to play a few tunes for the patients, their families and staff. We gained the most from that experience. We’re really glad we were there – Jeff Hanna. The Nitty Gritty Dirt Band also performed at the 2016 St. Anthony Hospital Gala for more than 900 in attendance. The gala, organized by the St. Anthony Hospital Foundation, raises money for St. Anthony Hospital programs and services. Jeff Brickman, Group President, Mountains and North Denver Operating Group and President and CEO of St. Anthony Hospital was thrilled that the band took time out of its schedule to visit with Hospital staff, visitors and patients. “Music is therapeutic and provides another mechanism for healing. Everyone seemed to really enjoy it,” Brickman said. The Nitty Gritty Dirt Band continues to tour in celebration of their 50th anniversary, with additional dates to be announced. Select shows will feature special guests. March 11 The Palladium at Center for the Performing Arts – Carmel, Ind. March 18 French Lick Resort – French Lick, Ind. March 19 Little River Casino Resort – Manistee, Mich.
April 29 Las Cruces Downtown – Las Cruces, N.M.
April 30 Talking Stick Resort and Casino – Scottsdale, Ariz.
May 20 Penn’s Peak – Jim Thorpe, Pa.
May 21 The Colonial Theatre – Phoenixville, Pa.
June 18 Southwind Casino – Braman, Okla.
July 08 Hodag Festival – Rhinelander, Wis.
Aug 06 Lake Superior Big Top Chautauqua Bayfield, Wis.
For more information, visit nittygritty.com or follow them on Facebook, Twitter and YouTube. The iconic and profoundly influential Nitty Gritty Dirt Band, often cited as a catalyst for an entire movement in country, rock and American roots music, is celebrating its 50th anniversary of nonstop touring and recording vital music. Formed in California in 1966, the Nitty Gritty Dirt Band consists of founding members Jeff Hanna (guitars/vocals), Jimmie Fadden (drums/harmonica/vocals), John McEuen (banjo/fiddle/guitar/mandolin), and Bob Carpenter (keyboards/accordion/vocals), “The New Guy” since 1977. The group has lasted longer than virtually any other country-based group of their era with multi-platinum and gold records, including legendary hits “Mr. Bojangles” and “Fishin’ in the Dark” (certified platinum for digital downloads in 2014 and the longest recurrent country radio song of all time). Their groundbreaking 1972 Will The Circle Be Unbroken album, which assembled the living legends of country, bluegrass and mountain music to record what many critics have hailed as “an American treasure,” has been inducted into the U.S. Library of Congress and the Grammy Hall of Fame, paving the way for generations of what’s now known as today’s “cross genre movement.” “Mr. Bojangles” was also inducted into the Grammy Hall of Fame in 2010. Most recently the Nitty Gritty Dirty Band was inducted into the Colorado Music Hall of Fame, class of 2015. St. Anthony Hospital is nationally recognized for its renowned programs in trauma, cardiovascular services, oncology, neurosciences and orthopedics. St. Anthony Hospital’s expert team of physicians, nurses and other caregivers provide unparalleled medical care for patients and access to the latest in medical technology. St Anthony Hospital is part of Centura Health, which connects individuals, families and neighbourhoods across Colorado and western Kansas with more than 6,000 physicians and 21,000 of the best hearts and minds in health care.